What seemed to be a likely confirmation of a attempted breakout, turned out disappointing in the last hour and half of the trade as the Markets witnessed a profit taking bout from higher levels. The NIFTY pared all of its gains and finally settled the day with net loss of 40.75 points or 0.39%. The fact that was technically significant in the Wednesday’s trade what that the NIFTY has still not yet confirmed its attempted breakout. Going into trade on Thursday, the levels of 10490 shall remain critically important for the Markets. NIFTY will have to move past and trade above 10490 to avoid any weakness. 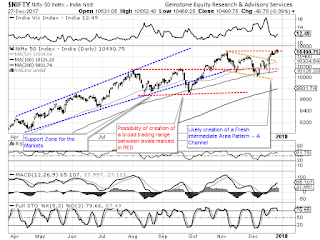 Any slip below this level will see the Markets being forced into some more corrective consolidation. The levels of 10535 and 10580 will play out as resistance levels while the supports will come in at 10440 and 10405 zones. The Relative Strength Index –RSI on the Daily Chart is 61.7832 and it remains neutral showing no divergence against the price. The Daily MACD stays bullish while still trading above its signal line. A black body emerged on Candle. But it remains insignificant in the present scenario. The pattern analysis clearly shows lack of confirmation of the attempted breakout. The NIFTY has taken support on the same value i.e. 10490 which is the level it attempted to breach on the upside. 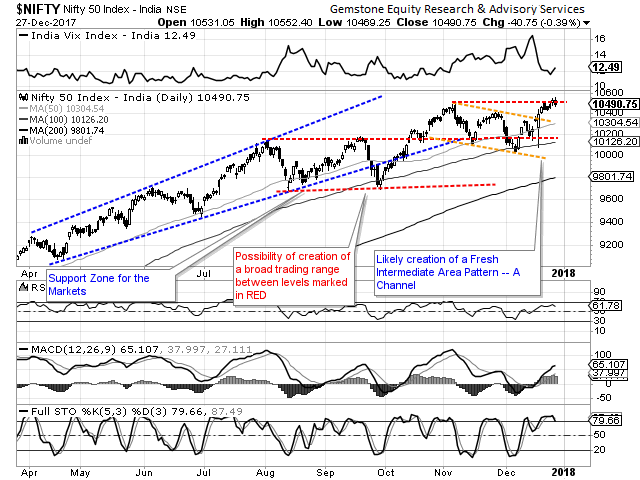 This level remains important and might dictate the movement of NIFTY over coming days. We also enter the expiry day of the current derivative series and we will continue to see the session remaining dominated with rollover centric activities. Unless the NIFTY moves past the level of 10490 in a comprehensive manner, it will continue to remain susceptible to volatile profit taking bouts at higher levels. While continuing to keep exposures at very modest levels, highly cautious view is advised for the day.